All opinions, analysis and conclusions are my own. All data was obtained from publicly available sources. On the 29th March 2017 the UK government activated Article 50, initiating a two-year countdown to the UK's departure from the EU. The government has already stated that freedom of movement of people will end in March 2019. From that date onwards, all foreign footballers – regardless of their origin – could require a work permit to sign for a club in the UK. This would have enormous consequences for British clubs and the future of British football. Over the last 20 years, Freedom of Movement of People (FoM) has transformed English football beyond all recognition. FoM bestows citizens of the European Union (or the wider European Economic Area) with the right to travel, reside and work in any member state. When an English football club decides whether to buy a foreign player it must consider the passports he holds. If the player holds an EU passport then there are no restrictions; from an employment perspective, he is treated the same as a UK national. If he does not hold an EU passport the club must obtain a work permit to enable him to play professionally in England. The rules governing the issuance of work permits are clear and stringent: the player must either be an established international for a top-50 ranked nation in FIFA’s World Ranking, or the club must demonstrate that they are willing to pay a substantial amount, in transfer fees and wages, to bring him to England. There is clearly a huge difference between recruiting players from EU and non-EU countries. In this post I explore the consequences of the end of freedom of movement of footballers to the UK. Based on a detailed, case-by-case analysis of nearly 1000 players imported since 1992, I will demonstrate that the majority would not have qualified for a work permit under the current rules, including players of the calibre of Cesc Fàbregas, Héctor Bellerín and N’Golo Kanté. I will investigate the impact of the end of FoM on the recruitment of players, and identify the clubs that would be most affected. I will show how, over the course of a decade, the proportion of foreign players in the EPL could return to the levels last seen in the 1990s. For the sake of brevity I will refer to ‘EU players’ throughout this post; it should be assumed that this also encompasses players from EEA or EFTA member-states, i.e. Norway, Iceland, Liechtenstein and Switzerland. The most important moment in English domestic football arrived on 15th December 1995 with a decision from the European Court of Justice. Known as the ‘Bosman Ruling’ after the player that brought the case, the ECJ’s ruling had two major consequences. First, on the expiration of their contract, players could move freely between clubs. Often referred to as a “Bosman” transfer, a player would henceforth be free to sign for any club he wanted. Secondly, and potentially with even greater consequences, it was ruled that domestic quotas on players from other EU countries were illegal. Prior to the ruling, EPL clubs were allowed to field a maximum of three ‘foreign’ players in domestic league and cup matches. A foreign player was defined as someone that held neither a UK nor an Irish passport. There was no distinction between players from Belgium and Brazil, even though Belgians had held the right to live and work in the UK for several years under FoM. 15% of the players that featured in the 1994/95 season were classified as ‘foreign’. In December 1995 that quota was rescinded, immediately removing all restrictions on fielding players from the EU. Clubs were still required to obtain work permits for non-EU players – a significant obstruction – but, because of freedom of movement, the demand for footballers with EU passports grew enormously. Cultural barriers aside, there were now no differences between recruiting a player from the Netherlands and Newcastle. Figure 1 shows the proportion of players from the UK & Ireland (red line), the rest of the EU (blue line), and the rest of the world (black line) that were playing in the EPL in each season since its inception. In the earliest years, when the 3-foreigner rule was in force, 90% of EPL players held UK or Irish passports (although the proportion was slowly falling). In the years immediately following the ECJ’s ruling and the removal of the 3-foreigner rule, the proportion of players from the rest of the EU increased rapidly, tripling from 8% in 94/95 to 24% in 97/98, with a corresponding decline in the number of British and Irish players. The number of players from non-EU countries also increased, but much more gradually. Figure 1. The proportion of domestic and foreign players in the EPL since 1992/93. The red line shows the percentage of UK & Irish players; the blue line, players from the rest of the EU/EEA; and the red line, players from the rest of the world. Foreign players that also held UK passports are counted as being from the UK. Data from transfermarkt.co.uk and other sources. Over the last 20 years, the EU/EEA has expanded, bringing 12 new countries into the freedom of movement area. 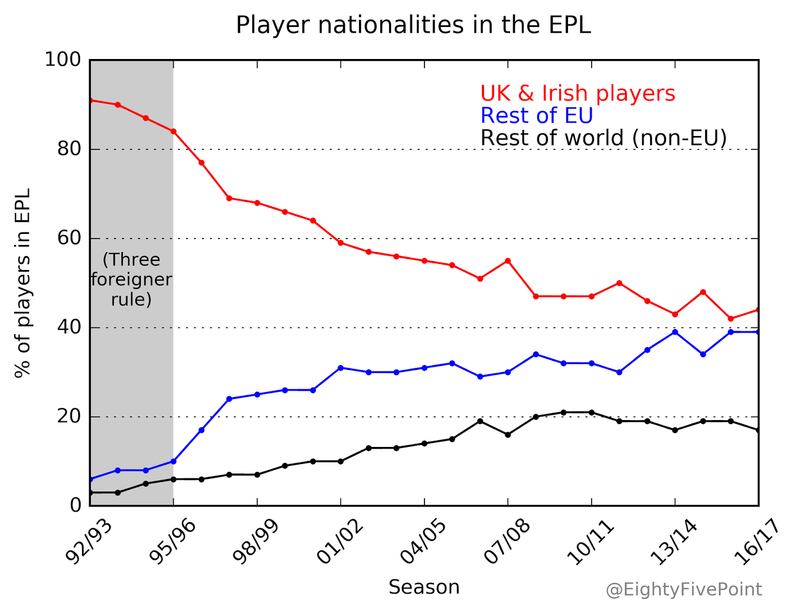 The proportion of UK and Irish players in the EPL has continued to decrease: last season they accounted for only 44% of all EPL players. Players from the rest of the EU accounted for 39%, with non-EU players accounting for 17%. Even in the Championship, over 20% of players originated from the rest of the EU. Is there any other industry in which freedom of movement has had such a large impact on recruitment? Brexit and the Future of English Football. The UK government has stated that freedom of movement of people will end when the UK leaves the EU. What would be the consequences for English football? It is unlikely that EPL clubs would immediately be required to obtain work permits for all their non-British players, and recruitment of players from EU countries would not simply cease. However, players coming from the EU could well become subject to the rules that currently apply only to non-EU players. That is, all players that are not eligible for a UK passport would have to obtain a work permit from the Home Office. To investigate the potential future impact on British football, I’ll take a look back at the characteristics of European players that have played in the EPL over the last 25 years. At what stage of their career did these players come to England? How much international experience did they have? Crucially: what proportion of them would have qualified for a work permit? By answering these questions we can gain an insight into what might happen in the future should the UK indeed end the automatic right of EU citizens to live and work in the UK. I have reviewed the case of every EU/EEA footballer to have played in the EPL, applying current work permit guidelines to determine whether each would have qualified for a permit on his arrival in England. Such an analysis is only possible because the current criteria that determine whether a foreign footballer is eligible for a work permit are clear and objective. That was not always the case: in 2015 the FA and Home Office agreed a new set of rules that “will make it far easier for us to identify and attract top quality players that truly are at the elite level, and it will make it far tougher for those who don’t meet the quality standard to get to play in Britain.” (Greg Dyke, March 2015). Prior to 2015, many players would fail to meet the existing criteria, but would receive permits through a highly subjective appeals process. What are the criteria for obtaining a work permit? To do so, a footballer must secure a Governing Body Endorsement (GBE) from the FA. Each season the FA publishes guidelines to help clubs determine whether transfer targets would qualify for a GBE. The guidelines for the 2017/18 can be found here. There are effectively two paths by which a player can qualify. To automatically qualify, a player must have participated in a minimum percentage of his national team’s senior competitive matches in the preceding 2 years. The ‘minimum percentage’ is determined by the FIFA world ranking of the nation in question, as shown below. 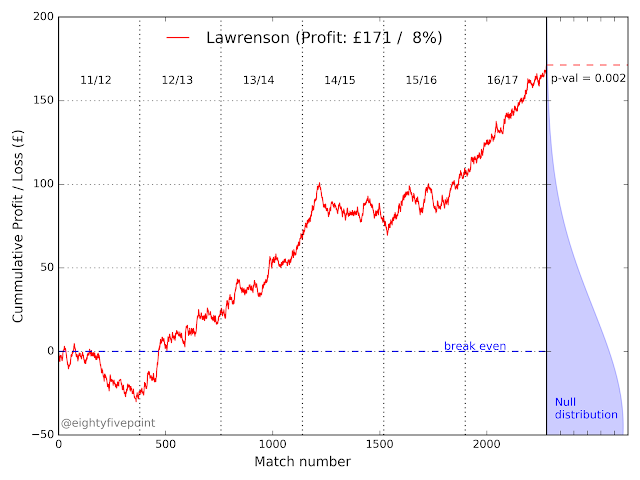 If the automatic criterion is not met, the player can appeal. The appeals process is a points-based system that essentially requires that the player has experience playing at an elite level abroad, and that the purchasing club demonstrate the value of the player through the amount they are willing to pay for him, both in transfer fee and wages. This step is a little more complex, but it boils down to the following: if the transfer fee is above the average amount paid by EPL clubs over the previous year, and the club is willing to make him one of their higher earners, then the appeals board can recommend that a permit should be approved. It’s fairly straightforward to establish whether a player had played in a sufficient proportion of international matches, but the appeals process criteria are more difficult to assess. In particular, data on player wages is very hard to come by. To apply the secondary rules, I made the simplifying assumption that if the club paid an above-average transfer fee for the player, it would also pay him a sufficiently high wage. Based on this assumption, I was able to apply the FA’s guidelines and make an educated guess as to whether each player would have qualified for a permit. How many EU players would not have qualified for a work permit? I have identified 968 players from the EU/EEA (excluding the UK and Ireland) that transferred to an EPL club between 1992 and 2016 and played at least one league match for that club. This includes players that elected to play for a non-EU country but possess an EU passport (such as André Ayew, who was born in France but plays for Ghana). I have examined the work permit credentials of each player once: the first time they were transferred to an English club from abroad. I have not considered the cases of players transferring between English clubs: once a player has resided in the country, he may have recourse to other means of remaining besides a work permit (for example, by qualifying for permanent residency). Of the 968 players, I estimate that only 402 – or 42% – would have qualified for a work permit as the rules stand. Had they not held an EU passport, the remaining 566 players would not have been permitted to play professional football in the UK. 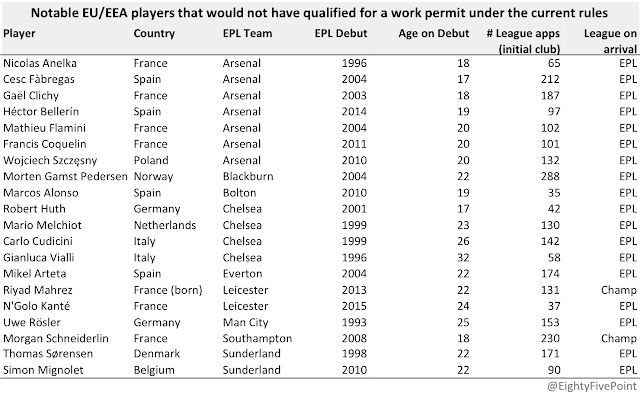 Figure 2 shows, club-by-club, the proportion of players would have qualified for a work permit. For clarity, I’ve limited the plot to clubs that have imported at least 16 players from other EU countries since 1992/93. The plot does not include players recruited whilst a club was playing in a division below the EPL. The big clubs – such as Arsenal, Chelsea, Spurs, Liverpool and Man United – would have been able to obtain permits for a much larger proportion of their European imports than smaller clubs, such as Derby, Swansea and Bolton. Two-thirds of Chelsea’s imports since the 92/93 season would have met the relevant criteria, compared to less than a quarter of those recruited by Watford, Bolton, Sunderland or Derby. This is not particularly surprising. The bigger clubs shop at the higher end of the European transfer market and are therefore more likely to purchase players that meet the international appearances criterion. Even if a player has not played the requisite proportion of matches for his country, the richer clubs have the financial firepower to meet the supplementary criteria for a work permit, paying large transfer fees and wages. Figure 2. Blue bars: the proportion of EU (excluding British and Irish) players since 1992 that would have qualified for a work permit under the current rules. Only clubs that have bought at least 16 EU players are plotted. Players brought in while the club was in a lower division are not included. The red line shows the results when all players under the age of 23 are excluded. There is one exception to this that would predominantly affect the big clubs: the recruitment of youth players. The rate at which EPL clubs have brought players under the age of 23 from elsewhere in Europe to England has been steadily increasing over time. In the five seasons between 1995-2000, 39 young European players made their debut in the EPL. From 2000-2005 this increased to 55 players, and to 75 in the five seasons after that. Nearly half of these players went to one of the big six EPL teams, compared to less than a third of older players. With a few notable exceptions, young players are typically recruited as prospects for the future rather than immediate first team players. As such, they would be far less likely to meet the necessary criteria to qualify for a work permit. 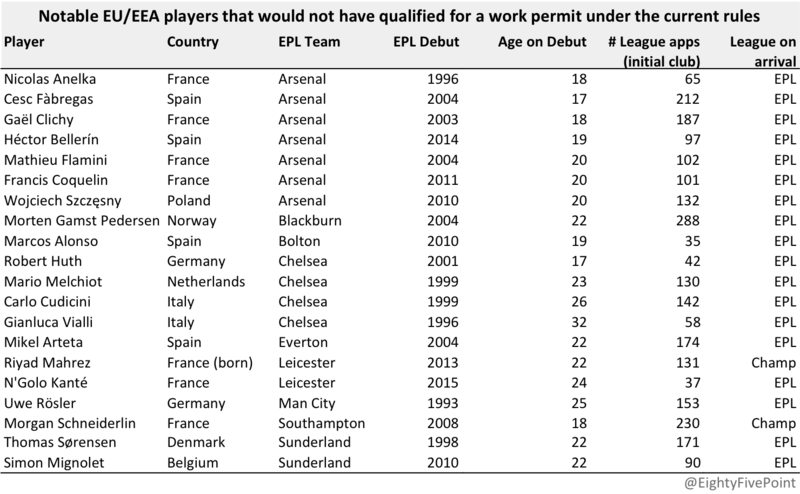 The red line in Figure 2 demonstrates the proportion of European players above the age of 23 that would have met the FA’s work permit criteria at each club. Excluding young players increases the proportion of players that would have qualified for work permits at all clubs, but particularly at the biggest clubs where the youth recruitment drive from Europe is most intense. Once young players are excluded, more than 80% of Arsenal’s senior recruits would qualify for a work permit, with Manchester United, Liverpool and Chelsea also seeing a substantial increase. There are, of course, players who would not initially have qualified for a work permit but went on to have succesfull careers at the club that brought them to England. Some examples are given in Table 1. A common characteristic of these players is their age on the date of their EPL debut. Of the twenty players listed, fifteen were under the age of 23, and ten were under the age of 21. Arsenal players from Spain and France are heavily represented – including high profile players such as Fabregas, Bellerin and Anelka – indicating the degree to which their youth recruitment strategy and development program has benefited from EU membership. At the other end of the age scale, Vialli arrived at Chelsea in 1996 on a free transfer having not played for Italy for several years. Table 1: Notable (non-British & Irish) EU/EEA passport holders that would not have qualified for a work permit when they first transferred to an English club. Rihad Mahrez is included on the list because, despite playing for the Algerian national team, he was born in France and is a French citizen. He would have failed to qualify for a work permit because, when Leicester bought him in January 2014 (for the modest fee of £750k), he had not played a sufficient number of competitive international matches for Algeria. N'Golo Kanté is a more complicated case. He had not yet made his international debut when he transferred to Leicester in August 2015, but Leicester did pay Caen a reported £5.6m to acquire him. To qualify for a work permit, his fee had to exceed the median EPL transfer fee paid by EPL clubs the previous year, and Kanté had to be in the top half of earners at Leicester. It’s a borderline case, but I suspect that the transfer fee was not quite high enough for him to qualify. There are several young players that are not on this list because of the amount their clubs were willing to pay for them. For instance, Manchester United paid Sporting Lisbon over £12m for an 18 year-old Cristiano Ronaldo at the beginning of the 2003/04 season. The large transfer fee, combined with the significant number of matches he played for Sporting the previous season (including European competitions), means that he probably would have scraped through. David De Gea, who was 20 years old when United purchased him from Atletico Madrid in 2011 for £18.9m is also likely to have qualified. What would be the consequences if, at the beginning of the 2019/20 season, incoming players from the rest of the EU were subject to the same immigration requirements that currently apply to non-EU players? The ability of the top 6-8 clubs to bring seasoned European players to the EPL would be largely unaffected: these clubs already shop at the high-end of the market, purchasing proven international players for substantial sums. However, their ability to bring in young, talented but unproven players would be severely hampered by the difficulty of obtaining work permits for them. Overall, the number of European players in the EPL would undoubtedly fall, significantly so outside the top 6-8 English clubs. 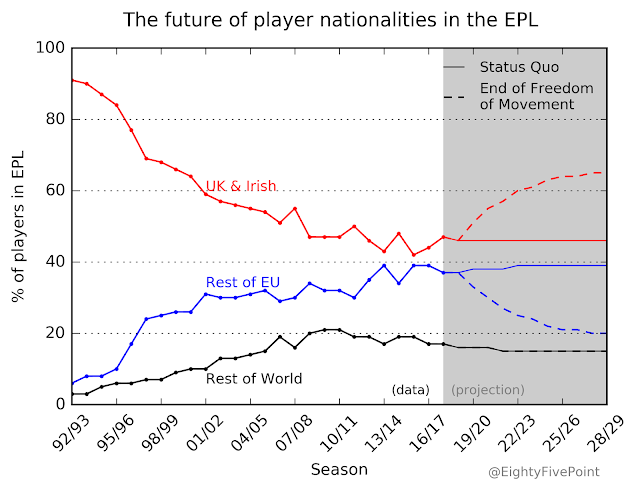 Figure 3 presents two projections of the proportion of foreign players in the EPL over the next decade. Each line shows the percentage of players from the UK & Ireland (red), the rest of Europe (blue) and the rest of the world (black). Data from previous seasons is represented by lines with dots; projections into the future are represented by the solid and dashed lines in the grey-shaded region. The figure shows two scenarios. The first is the ‘status quo’ (solid lines), in which EU & EEA passport holders can continue to play in the UK without work permits (or any other bureaucratic hurdles). The second explores the ‘end of free movement’ to the UK (dashed lines). 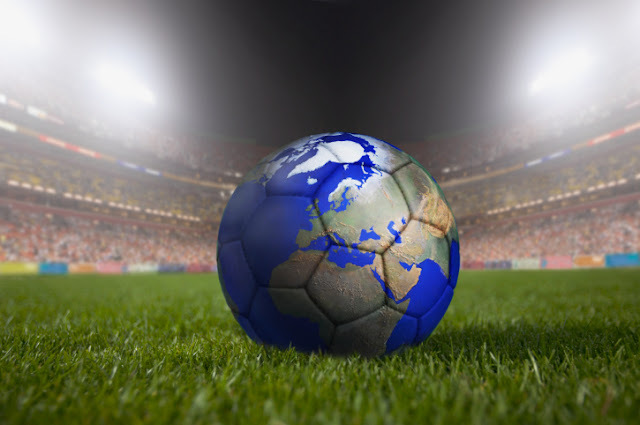 In this scenario, EU players are subject to the same immigration requirements as players from the rest of the world from the beginning of the 2019/20 season. That is, they will require a work permit and must meet the relevant criteria. In both cases I assume the total number of players in the EPL remains constant, as does the inflow and outflow of players from the rest of the world. In the status quo scenario, I assume that the inflow of players from Europe remains at its recent historical average; in the end of free movement scenario, I assume that it drops to 45% of the recent average (based on the analysis described above). Figure 3. A projection of the proportion of EPL players from UK & Ireland (red lines), the rest of the EU (blue) and the rest of the world (black), over the next decade. Two future scenarios are explored: the status quo (solid line) in which EPL clubs continue to be able to freely recruit players holding EU passports; and the ‘end of free movement’, in which players from the rest of the EU are subject to the same immigration requirements as those from the rest of the world (they must obtain a work permit). As you’d expect, in the status quo scenario the percentage of UK & Irish players remains close to its present value, declining slowly over the next decade. The proportion of players from the EU increases slightly, whilst those from the RoW remains relatively constant. The end of free movement scenario paints a very different picture. The proportion of EU players declines substantially – from 39% last season, to 20% by 2028/29 – whereas the proportion of British and Irish players increases from 44% to 65% over the same period. By the end of the next decade, the EPL would begin to resemble its constitution at the end of the 1990’s: nearly two-thirds of all players would be British or Irish. A significant drop in the number of EU/EEA players does not necessarily imply a return to the pre-Bosman era in terms of the quality of players on show. There would be no artificial quotas, and because of the money and allure of the Premier League, elite players will still want to come to England. The wealthiest clubs would continue to attract the biggest stars; the rest, on the other hand, would be forced to operate in a more restricted transfer market. Champions League places would move even further beyond the horizons of most clubs, and “near miracles” such as Leicester’s league win, would be become even less likely. On the other hand, some will argue that a drop in foreign recruitment would be a positive thing if it affords greater opportunities to British players. Would it really be a tragedy if Liverpool couldn't call on the “talents” of Simon Mignolet or Loris Karius, and were forced to look for goalkeepers closer to home? While the situation would likely be unchanged in terms of top-end recruitment at the elite clubs, even they would be forced to review their recruitment of young players from abroad. Homegrown players might have more of a chance of making it at the highest level. This analysis has focused on evaluating the impact of a complete end to freedom of movement of footballers to the UK. It is possible, of course, that some other arrangement could be made that would enable clubs to recruit from the EU more easily than elsewhere. The future is very uncertain, and these kind of decisions often have unforeseen consequences. In a subsequent post, I will investigate the consequences of Brexit on the lower English divisions and the Scottish Premier League. It is clear that the ECJ’s judgment in December 1995 triggered the greatest demographic change that British football has ever seen. In the future, we may look back to the 23rd June 2016 as being an equally significant date. Many thanks to David Shaw, Andrew Allen, Andrew Puopolo and Brendan Kent for comments. The European Economic Area refers the countries in which Freedom of Movement of People (and Goods, Services and Capital) applies. It includes all 28 members of the European Union plus Norway, Iceland, Liechtenstein and Switzerland. UEFA had a different set of rules for foreign players in Champions League, UEFA Cup and Cup Winners’ Cup matches that appeared less restrictive, but were actually far more so, for British clubs. Clubs competing in these competitions could field 3 foreigners plus two ‘assimilated’ players, the latter referring to foreign players that had already played 5 years in that country. However, in UEFA’s eyes, Welsh, Scottish and Irish players all counted as foreigners when playing for English clubs, which was not the case in English domestic competitions. This rule wreaked havoc with Alex Ferguson’s team selection in Man United’s early forays into the Champions League. Data taken from transfermarkt.co.uk, WikiPedia and here. This analysis used data taken from TransferLeague.co.uk, 11v11.com, transfermarkt.co.uk, futbol24.com, WikiPedia and the Transfer Price Index of Tomkins & Riley. The Bosman ruling was the worst disaster that happened to football (apart from those were people actually died) Jean-Marc Bosman deserve all the bad things that has happened to him since. muddling out identities of between national football leagues a cross Europe. Hopefully 20 years form now we will look at 23. Jun 2016 when English football was saved.